It’s no dress, but this optical illusion will definitely make your brain hurt. On Sunday afternoon, game developer Will Kerslake tweeted a picture of intersecting gray lines on a white background. There’s supposedly 12 black dots in this picture, but the problem is, most people can only see a couple at a time. It’s called Ninio’s extinction illusion. 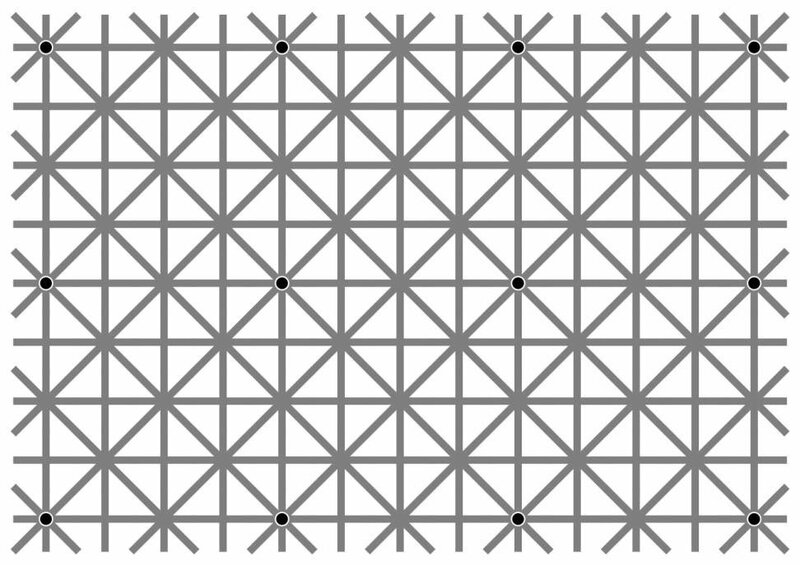 There are twelve black dots, but your (dumb) brain simply won’t allow you to see them all at once, so they blink in and out of existence where the gray lines meet. In the 24 hours since Kerslake posted the optical illusion to Twitter, it’s been shared and linked a combined 19,000 times. And everyone’s wondering what the hell is going on. If you’ve wasted a good five minutes trying to force your eyes to see all 12 dots, you’ll notice that the black dots (or dots) in the centre of your vision always appear. But the black dots around it seem to appear and disappear. That’s because we humans have pretty bad peripheral vision. Like The Verge explains, if you focus on a word in the center of a line of text you’ll see it clearly (given that you don’t have terrible eyesight). But if you try to read the words at either end without moving your eyes, those words will most likely look blurry. So, as a result, the brain has to make a guess about what’s likely in the blurry periphery area and fills in the mental image accordingly. Basically, when you’re staring at that black dot in the center of your field of view, your visual system is filling in what’s going on around it. With the pattern of grey lines on a white background, the brain guesses there will just be more of the same. And that’s why you can’t see the rest of the black dots.